At the core of the Brexit project has been the idea to "take back control", by reasserting UK parliamentary sovereignty. It would be ironic if the Brexit process now leads to Westminster losing control. After 20 months of negotiations, this week the British government agreed a UK-EU withdrawal treaty, which would be expected to be formally rubber-stamped at a specially convened European Council summit in Brussels on November 25. However, all eyes have shifted to the UK domestic politics of Brexit. Given the ongoing political drama in London, it is unclear whether the UK parliament will back the Withdrawal Agreement. A lot for Ireland is riding on how Westminster votes (expected shortly before Christmas). Worryingly, many seasoned British observers say the treaty may not pass. Within the Conservative party, both hard-line Brexiteer and committed Remainer MPs say they will vote against the agreement. The DUP, which props up the Conservative government, are also adamant they will vote No. It seems Mrs May will need votes from pro-Brexit MPs in the Labour Party, in part because the Liberal Democrats and the Scottish Nationalists have already declared against it. Labour's position on Brexit has not always been clear, but shadow Brexit secretary Keir Starmer has said it will vote against the government in the hope of bringing about a general election and/or another referendum. What happens if Westminster votes down the EU-UK treaty? No one knows, except political turmoil will likely ensue. But there are two procedural options. The first is that the UK crashes out of the EU at the end of March 2019 (the current official deadline), a chaotic no-deal Brexit. The second is London and Brussels agree to extend withdrawal negotiations, with the UK remaining in the EU until the political impasse is resolved. There currently appears to be little parliamentary appetite for a potentially disastrous no-deal Brexit, a scenario that could lead to a hard Border in Ireland. An alternative could be continuing negotiations - this would require a formal request from the UK government to the other EU governments to agree to an extension. That could be led by a new prime minister as Mrs May might not survive a parliamentary defeat of the treaty (and she may face a leadership challenge in the meantime). But would a disunited Tory Party quickly unite around a new party leader? Or might a general election be necessary, as Labour wants, if parliament cannot find a majority for a new government? Alternatively, might even a national unity government emerge, as some MPs have called for? And what might a new government then do: try to renegotiate with the EU, or even decide to hold another referendum? All bets would be off. Alongside ongoing no-deal preparations, the EU would likely respond favourably to a British request to extend the Brexit deadline beyond the end of March. Yet Brussels would not be keen on a lengthy extension. 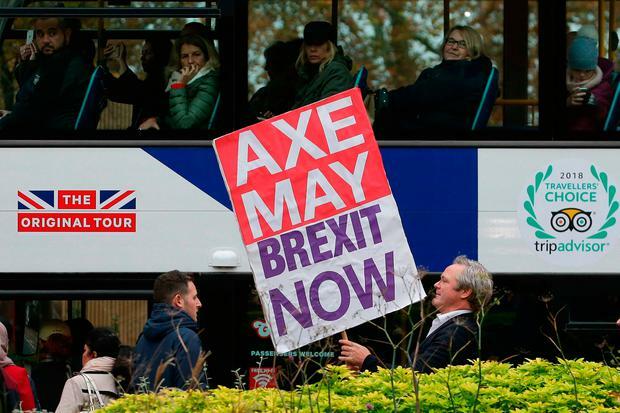 Otherwise, the UK - which would still be an EU member - could be obliged to hold elections to the European Parliament in mid-May, which would greatly complicate decision-making. However, if the UK government declared it would not only hold another referendum, but would also be prepared to campaign to remain in the EU, Brussels would surely find a way to extend the UK's stay to allow time for that. Signs are that Westminster ratifying the Withdrawal Agreement is not a foregone conclusion. But a week is a very long time in Brexit politics, and the Westminster vote will not be held for at least another four to five weeks. This week's EU-UK agreement was an outstanding diplomatic achievement for Ireland. It relied on impressive solidarity from the other 26 remaining EU member states, the European Parliament and the European Council, as well as the skill and determination of the European Commission negotiators. To paraphrase Oscar Wilde, as the UK confronts the price of Brexit, the EU has shown its value to Ireland.